In the picture you see the trace of a cone of Cherenkov light produced in the Japanese experiment Kamiokande, based on 50000t of water kept “observed” by 11000 photomultiplier tubes. The interaction of a neutrino with electrons or nuclei of water can produce a charged particle that moves faster than the light in water (but obviously, more slowly of light in vacuum) . This fact generates a flash of light due to the Cerenkov radiation, that is the optical equivalent of the sonic boom. This flash of light creates distinctive tracks that are recorded and provide information about the direction and type of incident neutrino. 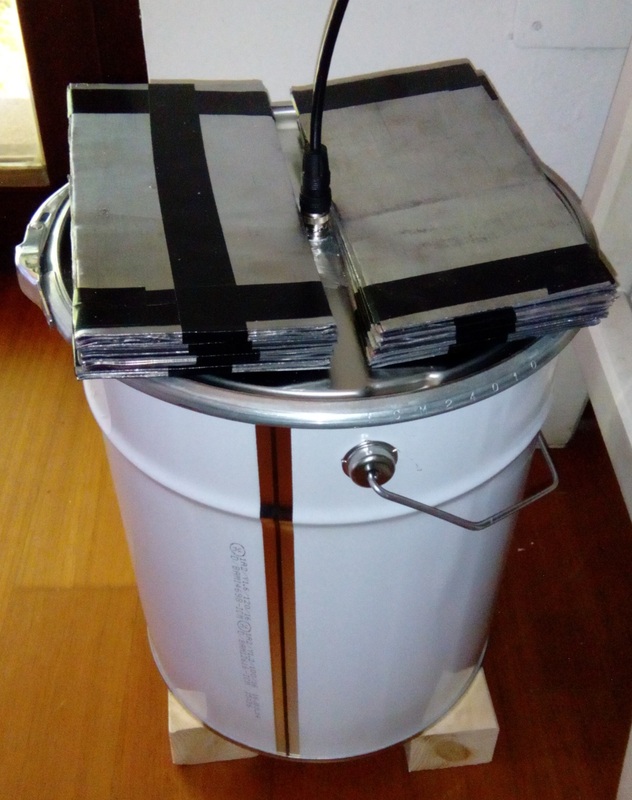 In this post we propose the construction of a DIY Cherenkov detector for the detection of cosmic particles, mainly muons. While electrodynamics holds that the speed of light in a vacuum is a universal constant (c), the speed at which light propagates in a material may be significantly less than c. For example, the speed of the propagation of light in water is only 0.75c. Matter can be accelerated beyond this speed (although still to less than c) during nuclear reactions and in particle accelerators. Cherenkov radiation results when a charged particle, most commonly an electron, travels through a dielectric (electrically polarizable) medium with a speed greater than that at which light propagates in the same medium. As a charged particle travels, it disrupts the local electromagnetic field in its medium. In particular, the medium becomes electrically polarized by the particle’s electric field. If the particle travels slowly then the disturbance elastically relaxes back to mechanical equilibrium as the particle passes. When the particle is traveling fast enough, however, the limited response speed of the medium means that a disturbance is left in the wake of the particle, and the energy contained in this disturbance radiates as a coherent shockwave. A common analogy is the sonic boom of a supersonic aircraft or bullet. The sound waves generated by the supersonic body propagate at the speed of sound itself; as such, the waves travel slower than the speeding object and cannot propagate forward from the body, instead forming a shock front. In a similar way, a charged particle can generate a light shock wave as it travels through an insulator. 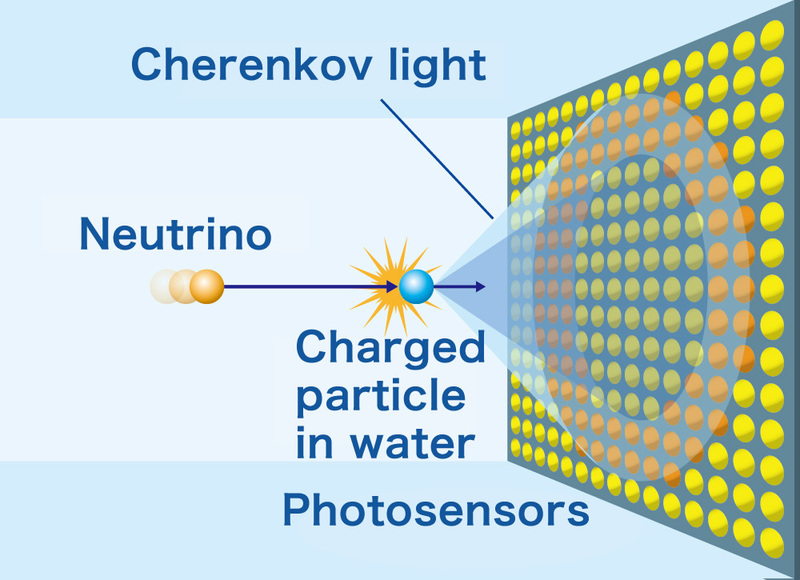 The Cherenkov light is also observed within the containment pools in nuclear reactors and it is caused by the Cherenkov light emitted by the beta radiation which travels inside the water. 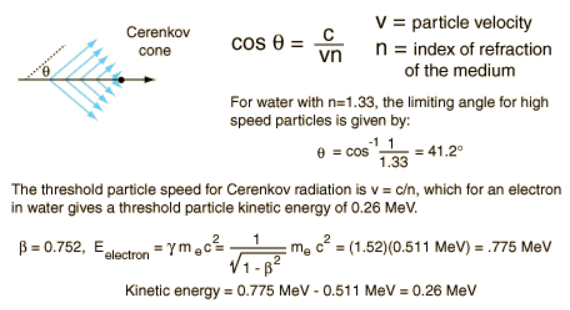 Characteristic of Cherenkov radiation is the so-called Cherenkov angle, indicated in figure with the letter θ, and can be calculated using the relationship shown in the figure, where n is the refractive index of the medium, and β is the ratio between the particle speed and the speed of light in vacuum β = v / c.
It can be seen that the maximum angle is reached when the particle is moving at approximately the speed c. In the case of water, where n = 1,33, the maximum angle is 41.2°. From the same equation it can be calculated the minimum speed (energy) in order to produce the Cherenkov emission, the minimum energy for an electron is 0,26MeV, for a muon instead the minimum energy to produce Cherenkov emission is 160MeV. 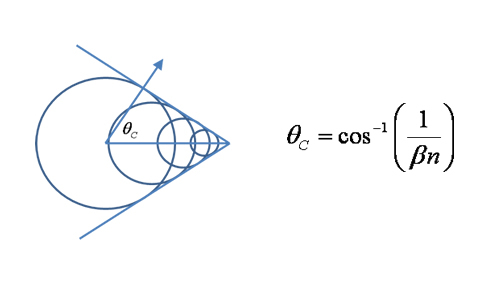 The scheme below illustrates this calculation in the case of an electron. 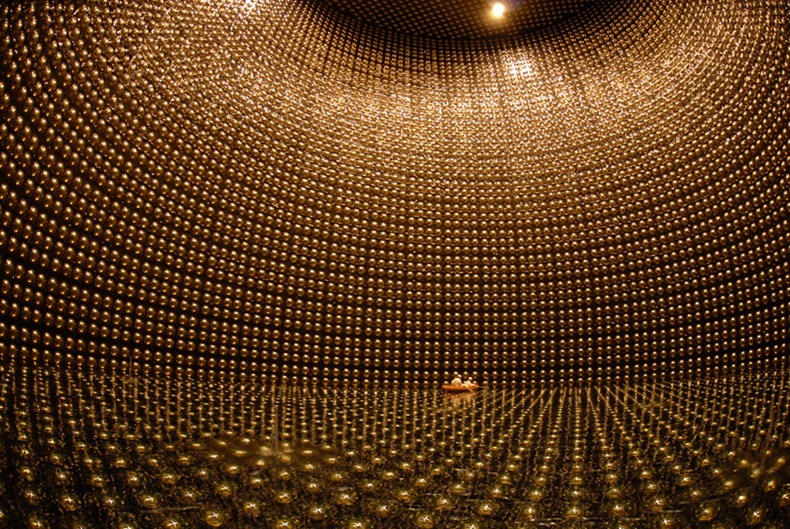 Super-Kamiokande (abbreviated to Super-K or SK) is a neutrino observatory located under Mount Ikeno near the city of Hida, Japan. The observatory was designed to search for proton decay, study solar and atmospheric neutrinos, and keep watch for supernovae in the Milky Way Galaxy. The Super-K is located underground in the Mozumi Mine in Hida’s Kamioka area. It consists of a cylindrical stainless steel tank that is 41.4 m tall and 39.3 m in diameter holding 50,000 tons of ultra-pure water. Mounted on the superstructure are 11,146 photomultiplier tubes (PMT) 50 cm in diameter. To realize the detector we chose a photomultiplier widely used in scintillation detectors, the model R6233 of Hamamatsu, with a large photocathode of 70mm, thus able to cover a fairly large area. 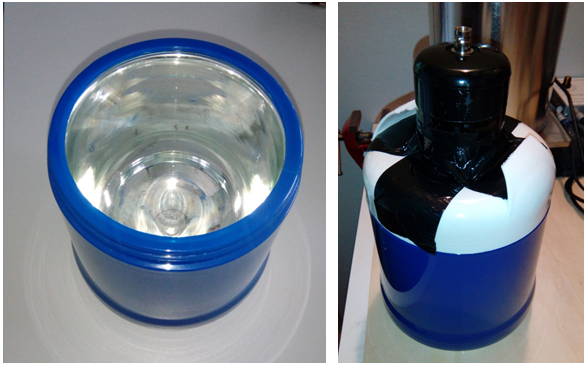 For the water tank it has been used a Dewar vessel scavenged from a food thermos. 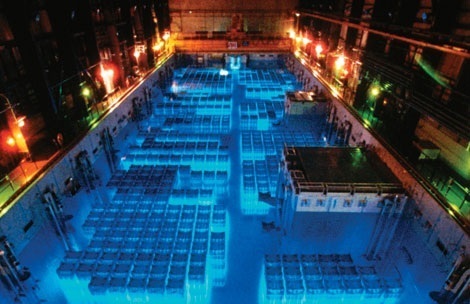 The Dewar vessel is made of glass and inside it is covered with a silver layer as a mirror, in this way the Cherenkov radiation which is produced downwards is reflected upwards by the walls of the Dewar and reaches, even if partially, the photo-cathode of the PMT. To reduce internal reflections the PMT was placed so that the photo-cathode is immersed within the water. Water must be distilled and purified so that internal absorption inside the liquid is minimized. 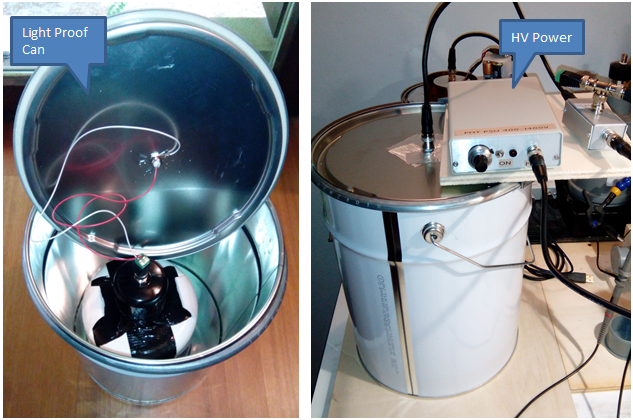 To prevent that the PMT is reached by ambient light, the detector has been inserted inside a light-proof container, provided with a BNC connector for the high voltage connection. 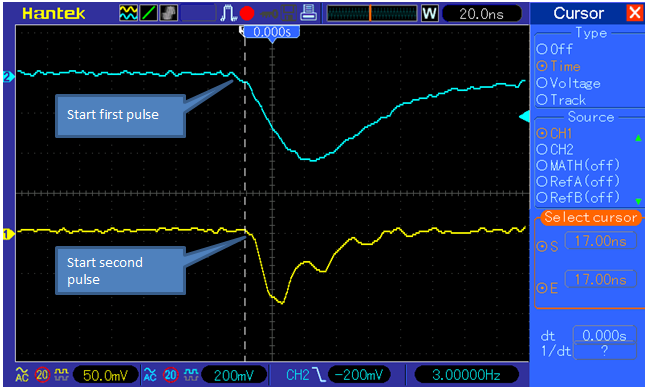 The signal is taken from a “splitter T “, provided with the decoupling capacitor. The splitter has been described in post “PMT Pulse Processing“. The figure below shows the complete setup. 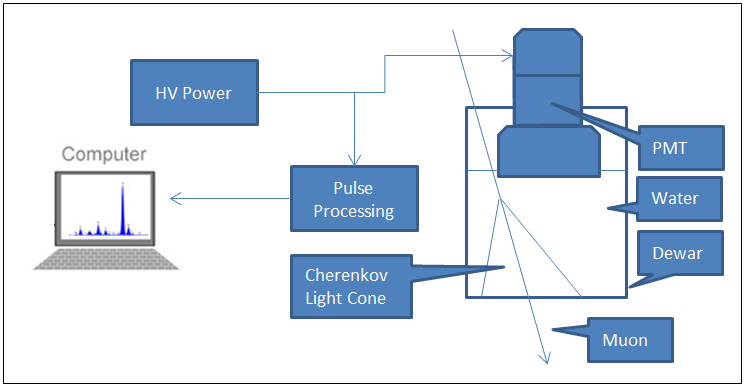 Using the setup described above we have acquired signals pulses from the PMT produced by Cherenkov radiation. The PMT has bee polarized at a voltage between 1000V and 1400V. 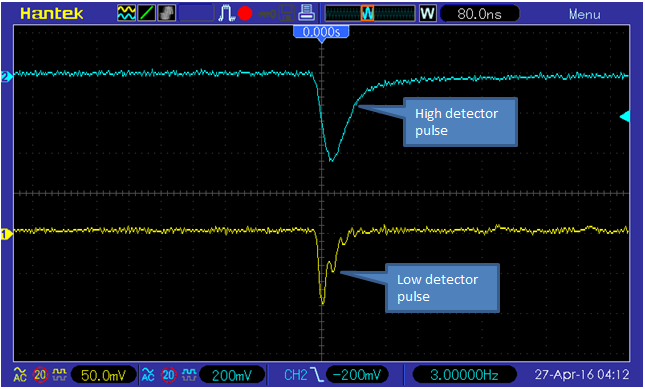 As output load resistance on the splitter we used the values of 1k and 50Ω. 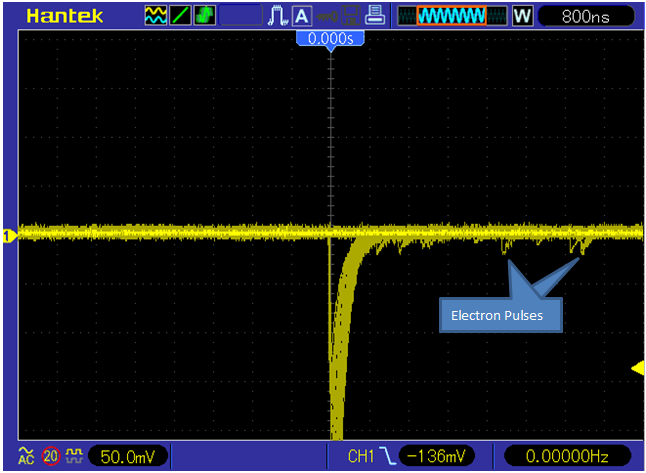 The greater value allow to have a fairly high amplitude signal but with a duration of almost 1μs, while with the 50Ω resistance, the pulse duration is very short, approximately 20ns and the amplitude is about 50mv. In both cases the signals that are obtained are well distinguished by the thermal noise of the PMT that has values with significantly lower amplitudes. This allows to make quite good counting measures. The pulses produced by the PMT may also be acquired by means of a transimpedance amplifier, like that one shown in the following scheme. 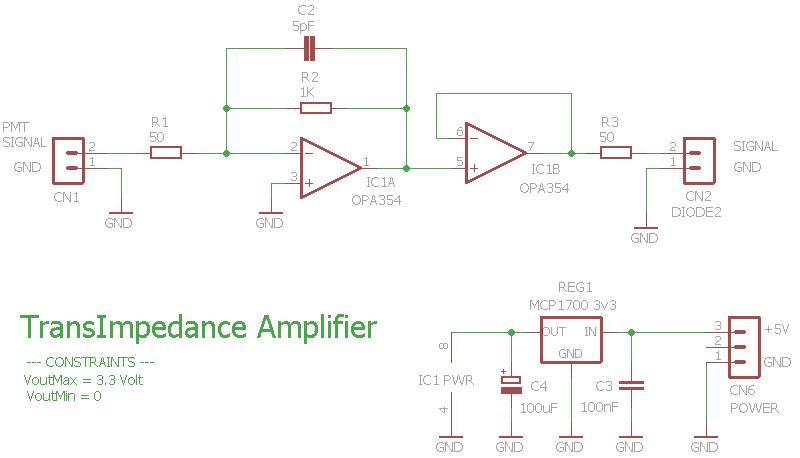 The advantage is that the load resistor may be set for example at 50Ω so as to reduce the time constant of the circuit, without sacrificing the amplification obtained by the resistor R2 : Vout = R2 * Ipmt. The figure below shows a pulse acquired with a TIA. 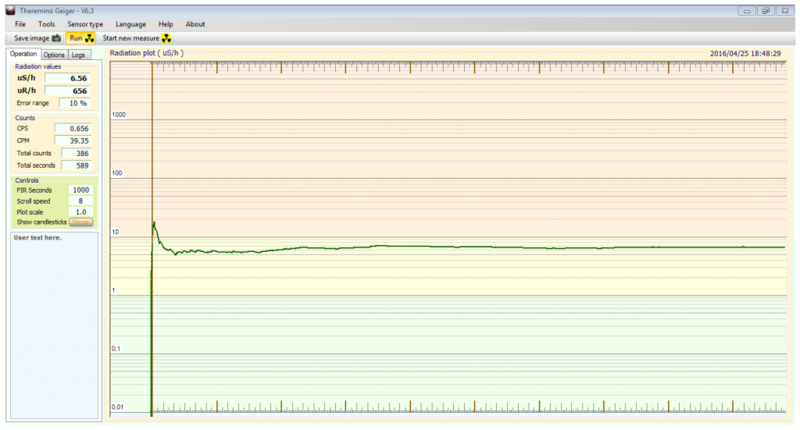 We see how the pulse FWHM is around 50ns. By sending the signal produced by the PMT to a pulses processing unit and suitably setting the discriminator threshold to exclude the pulses generated by the thermal noise of the PMT you get a count value of about 40CPM. Considering the surface area/volume occupied by the water and the PMT geometry this value seems consistent with the expected value of the muon flux. 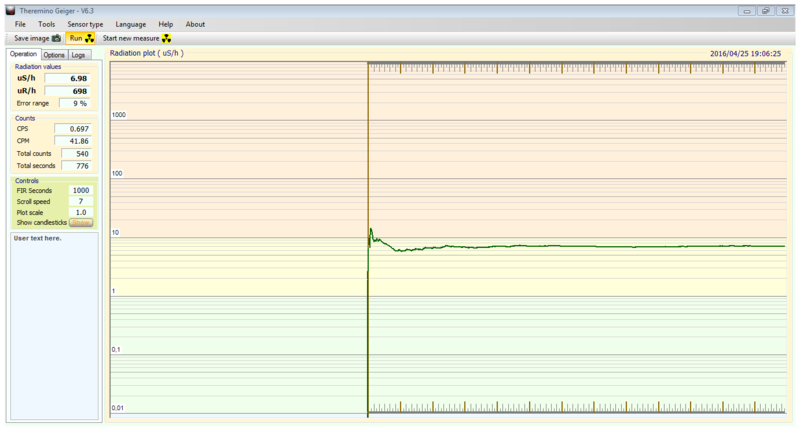 In the image below it is presented the result of the count performed with the Theremino Geiger software. We also tried to shield the detector with a screen of about 2cm of lead, with the aim to verify if the count undergoes changes. The image on the left shows the measurement setup with the screen. The result of the count is about 42CPM, slightly higher than the configuration without the screen. This is in line with the expected result due to the contribution of secondary particles generated inside the lead shield by the interaction of the soft component of cosmic rays (electromagnetic cascade); while the hard component is not absorbed the lead shield. As seen above, the Cherenkov detector records the passage of cosmic muons through the water detector. 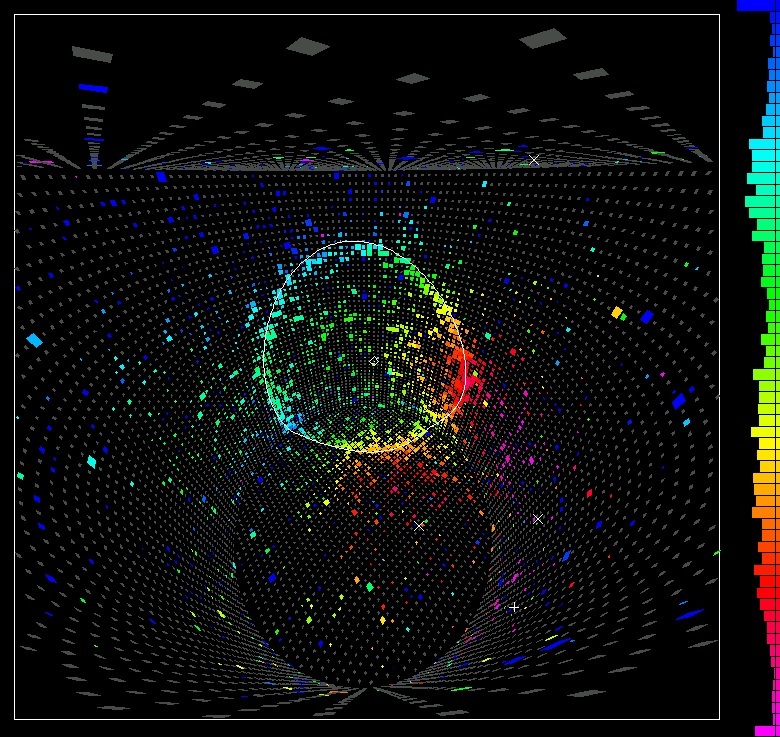 The muon is an unstable particle which naturally decays into an electron and a pair of neutrino, with an average life of about 2,2μs. The decay of the muon is an event that can be recorded in our DIY Cherenkov detector. When the muon interacts with the water, it can be slowed down almost to a stop, then it can undergo decay while still inside the detector. In this case the electron that is produced can in turn give rise to a Cherenkov pulse, immediately after the pulse produced by the muon. The decay of the muon has been previously studied in detail with a plastic scintillator whose description is presented in the following post Cosmic ray muons and muon lifetime. 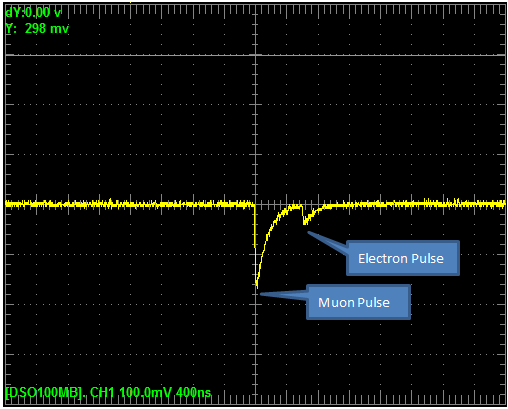 The figures below show the traces of muon decays recorded in our DIY detector. 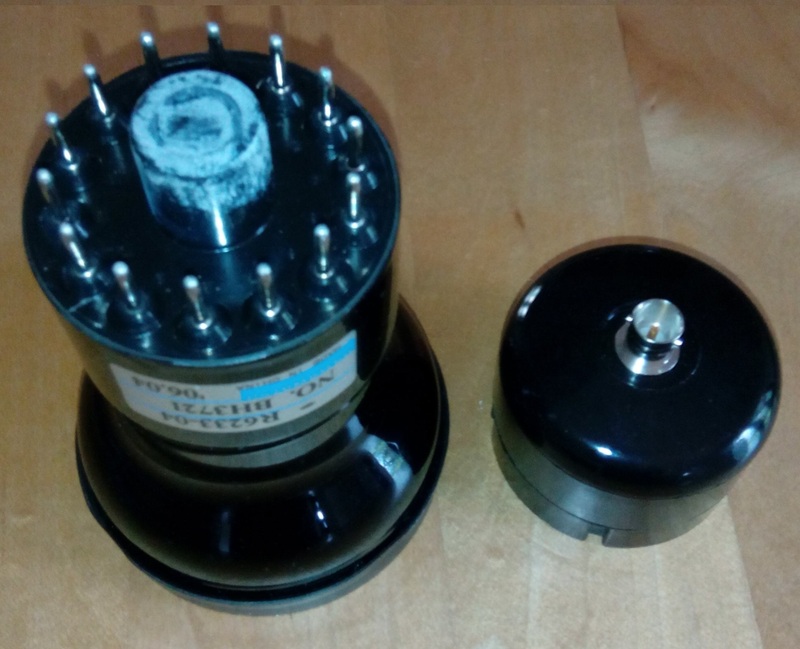 By using the Cherenkov detector and the plastic scintillator (described in the post scintillation detector of cosmic muons) it has been made a setup for the detection of coincident pulses. These pulses are produced by cosmic muons that pass through both detectors which are placed vertically, one above the other. The image at the side shows the positioning of the two detectors. The two detectors are placed at the distance of about 1m, with this geometry the number of events in coincidence is rather low : less than 1CPM, this is natural because the positioning of the two detectors at this distance greatly reduces the solid angle of the detection . Whereas muons can have speeds between c and 2/3c (2×108 m/s – 3×108 m/s), the time taken by muons to cover the distance of 1 m should be between 3ns and 5ns. In the images below we show some examples of coincidence pulses, in which it is clear that the order of magnitude of the delay of the second pulse is in accordance with what expected.